To complement the release of the new Z390 for Intel's Coffee-Lake refresh, the majority of the motherboard manufacturers has made key changes to their ranges which doesn't just stretch to new naming schemes, but entire ranges too. ASRock as a gaming brand in the past have relied on the 'Fatal1ty' branding which has been synonymous in more recent times with ASRock motherboards more than it has with anything else. In a complete switch around, ASRock for the Z390 chipset has dropped this and has rebranded their gaming range of motherboards with the new Phantom Gaming range which seemingly drops the primarily red and black theme, and implements a more neutral color scheme. The Phantom Gaming series seems reserved for the top end models, with ASRock also releasing a new Z390 Gaming K6 which is a direct replacement to the Z370 Gaming K6, their usual Pro4 ATX and mATX models and more recently, the newer Taichi models on the new Z390 chipset. 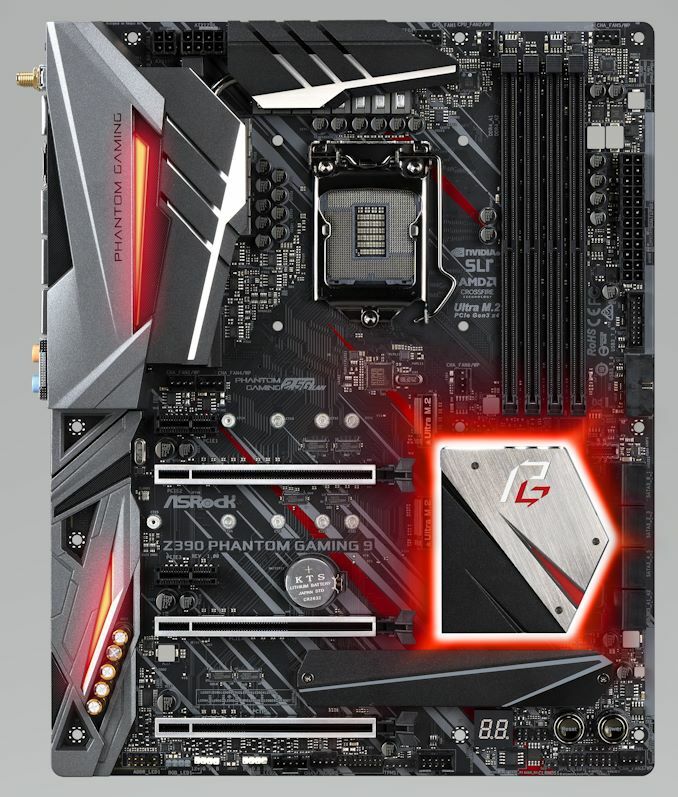 Starting with ASRock's new gaming-centric flagship motherboard, the Z390 Phantom Gaming 9, the overall design marks a slight movement away from the static red and black theme but instead replaces it with a more subtle black and grey design. There are some red accents around the chipset heatsink and on the PCB near the CPU socket, but on the whole, it looks rather stylish. The board is full sized ATX and does have plenty of RGB integrated including LEDs within the power delivery and chipset heatsinks, as well as implemented into the audio PCB cover. The board has an LED debug and onboard power and reset switches and offers a total of eight 4-pin fan headers. The bottom half of the board has three full-length PCIe 3.0 slots which operate at x16, x8 and x4 which means three-way CrossFire and two-way SLI multi-graphics card setups are made possible, with a further two PCIe 3.0 x1 slots also present. All three of the full-length PCIe slots feature metal slot protection. The board has a total of three M.2 slots with the bottom slot getting a heatsink, with all slots supporting both PCIe 3.0 x4 and SATA flavors of drives. In addition to the trio of M.2 slots is a total of eight SATA ports with support for RAID 0, 1, 5 and 10 arrays. The board has four RAM slots which support DDR4-4500 and offers a total capacity of up to 64 GB. On the rear panel, ASRock has implemented a total of three LAN ports which consist of two Intel Gigabit based LAN (I219V and I211AT) and a Realtek RTL8125AG 2.5G LAN controller. The Z390 Phantom Gaming 9 also includes a 2T2R 802.11ac Wave 2 capable Wi-Fi adapter making this one of the most comprehensive boards as far as networking connections go outside of the inclusion of a 5G or 10G port. A Realtek ALC1220 HD audio codec powers the five 3.5 mm audio jacks on the rear panel as well as the single S/PDIF optical output. USB wise the Z390 Phantom Gaming 9 has four USB 3.1 Gen 2 ports consisting of three Type-A and one Type-C port, with an additional four USB 3.0 Type-A ports. The board also includes a pair of video outputs which include a DisplayPort and HDMI 1,4 port and a handy reset CMOS switch; not to forget a PS/2 combo keyboard and mouse port. With a total of three LAN ports including a 2.5G port with a supplement of two Intel-based Gigabit LAN three M.2 and three full-length PCIe 3.0 slots (x16/x8/x8), the board screams high-end and as it stands, it currently sits atop of ASRock's current Z390 product stack. The MSRP ASRock are asking for the flagship Z390 Phantom Gaming 9 is set $270, and this is to be expected given the slew of high-end features and the fact it's one of the only boards to feature three LAN ports at launch on a consumer desktop board.